The 6840 series RF and microwave system analyzers are a powerful new tool for the microwave industry. Integrated into a single instrument are a synthesized source, a three input scalar analyzer and a synthesized spectrum analyzer. The internal source can be used as a simple CW output, as a swept source for scalar measurements, as a tracking generator with the spectrum analyzer and as an offset tracking source for network measurements on frequency translation devices. The range covers five frequency bands in various convenient combinations of source and spectrum analyzer frequencies, enabling for example the harmonic content of microwave radios to be measured. systems. Continuous full band sweeps simplify harmonic and spurious measurements. The low distortion front end combined with wide dynamic range ensures that even on full span sweeps, spurious measurements to better than -60 dBc can be performed. High sensitivity at microwave frequencies is ensured by the use of wideband oscillators, this reduces the harmonic number used in the front end mixer. The spectrum analyzer is fully featured with FM demodulator and built in loudspeaker. This is ideal for locating and identifying the source of interfering transmissions. 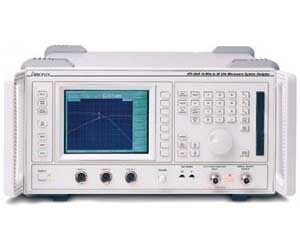 Individual signals can be precisely identified by use of the internal frequency counter. Optimized operation is provided by the coupling of the fundamental analyzer parameters of resolution bandwidth, sweep speed, video filter and input attenuation. These parameters are automatically set for optimum sweep speed and dynamic range. For specific applications the user can manually overide the coupled functions. Autotune automatically sweeps the full span of the spectrum analyzer and then displays the largest signal at the center and top of the screen. Markers can also be used to select any signal and display it at the center of the screen. The integral source enables network measurements in normal tracking mode or by applying a frequency offset and/or multiplication factor. Any frequency offset can be supported. This facility makes measurements faster and easier than assembling together separate instruments and a PC controller. External mixers extend the frequency range to 110 GHz.